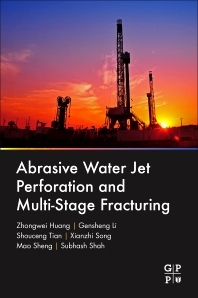 Abrasive Water Jet Perforation and Multi-Stage Fracturing gives petroleum engineers, well completion managers and fracturing specialists a critical guide to understanding all the details of the technology including materials, tools, design methods and field applications. The exploitation and development of unconventional oil and gas resources has continued to gain importance, and multi-stage fracturing with abrasive water jets has emerged as one of the top three principal methods to recover unconventional oil and gas, yet there is no one collective reference to explain the fundamentals, operations and influence this method can deliver. The book introduces current challenges and gives solutions for the problems encountered. Packed with references and real-world examples, the book equips engineers and specialists with a necessary reservoir stimulation tool to better understand today’s fracturing technology. Zhongwei Huang is currently a professor at the college of petroleum engineering at the China University of Petroleum, teaching well drilling, completion, and hydro-jet fracturing. He was previously a lecturer at the same school and a visiting scholar at the Colorado School of Mines. He has authored multiple articles and awarded nine grants to date. He earned a BE in drilling engineering, MSc in oil and gas well engineering, and a PhD in oil and gas well engineering, all from the China University of Petroleum. Dr. Gensheng Li concentrates on the research and application of water jet technology in drilling and well completion for over 30 years. His research interests include water jet assisted drilling within HPHT wells, abrasive jet perforation and multistage fracturing, and unconventional oil and gas well drilling and completion. He received the National Award fro Technological Invention in 2012 and National Award for Science and Technology Progress in 2007 as a principle investigator. Dr. Shoucheng Tian is currently an Associate Researcher in the college of petroleum engineering at the China University of Petroleum. Previously, he was a teacher at the Shengli Oilfield school. He has authored many papers, and he earned a BS in metal forming from the Northeast Heavy Machinery Institute, a MS in computer software and theory from China University of Petroleum, and a PhD in oil and gas well engineering from China University of Petroleum. Dr. Xianzhi Song is currently Associate Professor in the college of petroleum engineering at the China University of Petroleum, teaching advanced well completion engineering. He has authored multiple articles and is an active member of SPE. He earned a BS in petroleum engineering and a PhD in oil and gas well engineering, both from the China University of Petroleum. Dr. Mao Sheng is currently Assistant Professor in the school of petroleum engineering at the China University in Beijing, specializing in hydraulic fracturing propagation and shale-gas horizontal well completions. He has authored multiple journal articles and is an active member in SPE, AAPG, and AADE. He earned a BS in petroleum engineering and a PhD in oil and gas well engineering, both from the China University of Petroleum in Beijing. Dr. Subhash Shah is Emeritus Professor at the University of Oklahoma and the fellow of the American Institute of Chemical Engineers (AIChE). He has been working in the petroleum industry for over 40 years and a specialist on well completions, hydraulic fracturing, and coiled tubing flow. He earned a BS in chemical engineering from the University of Baroda, a MS and PHD, both in chemical engineering and both from the University of New Mexico.